Inside|Out is a design proposal for a stadium that not only looks towards the inside but also it provides the opportunity for the spectators to look out towards the city. 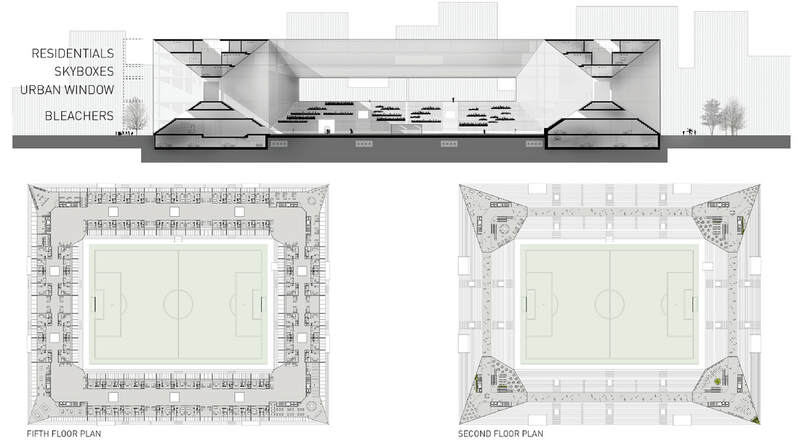 By dedicating the top half of the stadium to housing and integrating spaces that can add to the surrounding community Inside|Out aims to deviate from the traditional understanding of the stadium as an inward looking, self centered and solo event space and aims to be a stadium that is both inside and outside looking, multi-centered and able to facilitate multiple events at the same time. This proposal preserves the McCarren pool and baseball fields and imagines this complex as an asset for all New Yorkers. The stadium is organized in two halves, the bottom half provides the public amenities and the spaces necessary for the stadium. The top half provides 150 units of 1 bedroom and studios. By combining the infrastructure of the stadium and housing, providing spaces medium in addition to large spaces for the community to gather Inside|out aims to be a solution to the common problem of the stadiums’ obsolescence after the large events that they once serve.